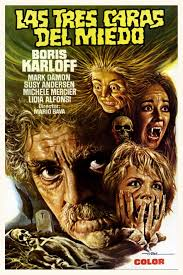 In early 1967, Karloff had traveled to Spain to film Cauldron of Blood. However, that film would not be released until 1970 after Karloff’s death. But, upon completion of the film and resting up, he returned to work for his next film that did see release that same year, The Sorcerers. By this time, his continued poor health and increasingly fragile condition prevented him from doing too much action. In fact, he tends to be seated for what seems like a lot of his onscreen time in this flick and when he does walk it is now with a cane. Karloff is Professor Marcus Monserret, a world-renowned hypnotist who has perfected a technique of controlling people by the power of his mind. His wife Estelle (Catherine Lacey, The Lady Vanishes, The Mummy’s Shroud) has grown weary of living in poverty but continues to support her husband. When he finally perfects his machine, they trick Mike Roscoe (Ian Ogilvy, She Beast, Witchfinder General) into coming back to their place and be hypnotized. They test out their connection to Mike and when they begin to feel and experience what he does, they know they have success. The professor is ready to finally prove his detractors wrong. However, Estelle would rather use Mike for her own selfish goals. Can the professor stop her before her desires get out of control? From the opening moments of the film, you know this is not going to be neither a typical Karloff film nor an easy one to watch. Karloff is seen walking with a cane down a street and you can just imagine how much pain he was in at this point. He is sporting a full beard now, looking like an old man on a summer vacation. When the credits begin to roll over late 60s rock music, it immediately pulled me out of the moment. The Sorcerers just doesn’t feel like a Karloff film. Director Michael Reeves would accomplish better things alongside Christopher Lee in Castle of the Living Dead 1964) and Vincent Price in Witchfinder General (1968). His next film was supposed to be The Oblong Box (1969), again with Vincent Price. However, before filming started, he was found dead after an accidental drug overdose. Unfortunately, The Sorcerers isn’t his best as it is just a poorly made film and doesn’t add to his short legacy. The script needed work but the role of Professor Monserrat is actually well developed but it gets rather tedious early one. Karloff really isn’t unique here as his role could have been played by anyone. Ironically, The Sorcerers did earn both Karloff and Lacey acting awards at the Trieste Film festival. The Sorcerers was originally written by John Burke but Reeves would not allow Burke to receive writing credit. To be fair, the finished film is definitely different from Burke’s original screenplay but he still deserved some credit. The screenplay would finally be released as a novel in 2013 two years after Burke’s death. For many years, The Sorcerers would be one of Karloff’s hardest films to find. It was never officially released on VHS with a poor film print circulating via the bootleg market. It was finally released in 2012 through the Warner Archive Collection. Check out this preview clip and I think you’ll get an idea what you’re in for. Not horrible but not the way I prefer my Karloff films to be. The year was 1965 and Boris Karloff was now 77 years old. At a time that most actors have long since retired or found that Hollywood has left them behind, Karloff was still in demand. Only his health was keeping him from the busy schedule he once had. His arthritis and emphysema were crippling at times, leaving him wheelchair bound and on oxygen. Yet, there were days when his stamina was high and he would move about as well as a man of 77 could. 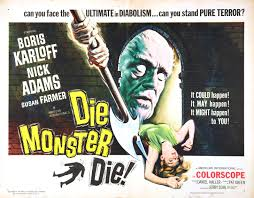 Still under contract to American International Pictures, his next effort would be Die, Monster, Die! The movie was based loosely on the H.P. Lovecraft story The Colour Out of Space. It could have benefited from more work on the script as writer Jerry Sohl should have read Lovecraft a little more. What we are left with is a rather boring tale about Stephen Reinhart (Nick Adams), an American scientist who visits the home of his fiancée, finding scorched earth and an enormous crater. As usual, the local townsfolk are fearful of Nahum Whitley (Boris Karloff), the girl’s father, because of his mysterious experiments. The radiation from a meteor is mutating the plants and the end results are horrifying. Suffice to say, the movie had great potential but failed in execution due to a very lackluster script. Karloff does what he can with the role, which is ultimately very little. And no, that was not actually Karloff in the end of the movie but a stunt double. His health clearly prevented that kind of movement anymore. After working as a set designer on some of Roger Corman’s Edgar Allan Poe films, such as House of Usher (1960) and The Pit and the Pendulum (1961), he would make his directorial debut with Die, Monster, Die!. He would get another shot at Lovecraft with The Dunwich Horror (1970) but most of the rest of his work would be done on television. Nick Adams was a popular young actor becoming known for his television work, which included his own series The Rebel, as well as Frankenstein Conquers The World and Invasion of Astro-Monster, both done in 1965. Sadly, he would pass away in 1968 at the age of only 36 due to a drug overdose. Karloff was a man who could not say no. Right before doing this film, he appeared in a cameo role in Bikini Beach, substituting for his friend Peter Lorre, who had passed away before production began. Right after Die, Monster, Die! wrapped, it was off to Hollywood for a guest appearance on the television series Shindig to read the Peppermint Twist and another cameo in the movie The Ghost in the Invisible Bikini. He would guest star on The Wild, Wild West and I,Spy while lending his voice for such productions as The Daydreamer and Mad Monster Party?. However, his narration of How The Grinch Stole Christmas! was something he dearly loved as he enjoyed giving back to children and greatly appreciated the work of Theodor Geisel aka Dr. Seuss. It continues to be one of his most well-known works today, heard numerous times every holiday season. Check out the trailer for Die, Monster, Die! as you shop around for the Blu-ray. I recommend you buy it only if you are obsessive about having a complete collection. It’s not horrible but, honestly, not that good either. But it does look great, so at least there is that going for it. 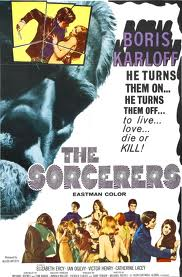 Next time, we leap ahead to 1967 as Karloff is back in the UK for The Sorcerers. And here is your fair warning, I won’t be stopping with Day 31 as there is too much Karloff for just one month. Mark your calendars because there will be posts through November 2! Then maybe I’ll take a rest! In 1963, Boris Karloff would have some of the most fun on a movie set in the later part of his career with the film Black Sabbath. 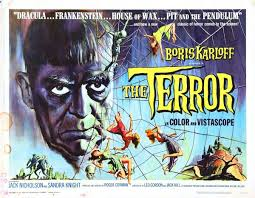 Karloff was under contract to American International Pictures and was eager to work with director Mario Bava. Black Sunday was a marvelous film and Karloff loved the visual aspects of Bava’s films along with his subtle nature towards horror. Black Sabbath was an anthology of three tales with Karloff starring in “The Wurdalak” segment. The original Italian version and the American version do have some big differences. The order of the three tales is different depending on which version you watch. In the Italian version, “The Telephone” story comes first followed by “The Wurdalak” and then, finally, “The Drop of Water”. However, in the American version, “The Drop of Water” comes first followed by “The Telephone” and, saving Karloff for last, “The Wurdalak”. This is clearly to capitalize on Karloff’s star status in the United States, clearly evident from the trailer. Unfortunately, the stories themselves also had edits made. In the American version of “The Telephone”, all elements of lesbianism are removed as well as the character of Frank being rewritten from his original role of a pimp. “The Wurdalak” had some alternate shots and certain violent scenes trimmed down but “The Drop of Water” was essentially unchanged. The soundtrack is completely different with the original music of Roberto Nicolosi replaced with that of Lex Baxter. Finally, the film visually looks different due to different color processing for each of the prints. 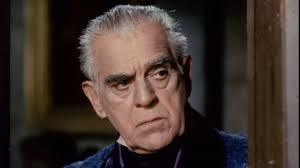 Most notably, the big difference is the role that Boris Karloff has in each film. He filmed segments that used him as a narrator or host, introducing each of the stories, much like he had done a few years earlier on his television series Thriller. However, these segments were cut from the Italian version. Only a version of the opening monologue remains and the movie ends with Karloff (as Gorca) riding an obviously fake horse serving up a bizarre epilogue that has the camera pulling back to reveal the sound stage and crew. The American version has a different opening monologue and the individual introductions without the bizarre Italian ending. Luckily, the print I have in my collection is the American print so not only do I get more Karloff, I also get to hear his real voice. A Blu-ray was to have been released this month but was canceled due to rights issues. Supposedly, some prints are out there but be prepared to pay top dollar. Karloff’s segment has him playing a vampire for the only time in his career. Set in 19th century Russia, Gorca (Boris Karloff) has left his family to fight a vampire, known here as a wurdalak, only to return with a mean disposition and looking disheveled. The tale that follows has Gorca feeding off his family one by one in rather gruesome manner. It would be great to see the original and unedited version. While it is available, I’ve not yet seen it as I’m not sure I would enjoy seeing Karloff as much without hearing his voice. However, his dialogue here is limited so I just might have to put the Italian version on the list. On a fun side note, the rock group Black Sabbath got the name for their band from this film. As the legend goes, when they were still known as Earth, they were playing across the street from a movie theater that was playing Black Sabbath. They decided that people would pay more money to be frightened and thus, they changed their name. The rest is rock and roll history. I really had fun with Karloff in Black Sabbath. His role as host was a throwback to his days on The Veil or Thriller while it was great seeing him as a vampire. “The Drop of water” segment was creepy but “The Telephone” fell a little flat. Personal preference I guess. It is going to be tricky for you to find the American version on DVD. The Italian print is readily available on various sets and while the American version appears to be available based on website descriptions, it is usually the Italian print. So, buyer beware and prepare to do some hunting. 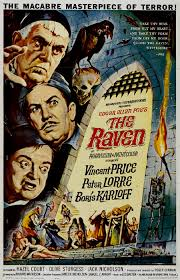 With the filming of The Raven (1963) finishing ahead of schedule, director Roger Corman decided he had enough time to do another movie despite being told it wasn’t possible. He wanted to take advantage of the wonderful sets as long as they were available and he had a potential cast. From this small recipe for disaster, The Terror (1963) was born. 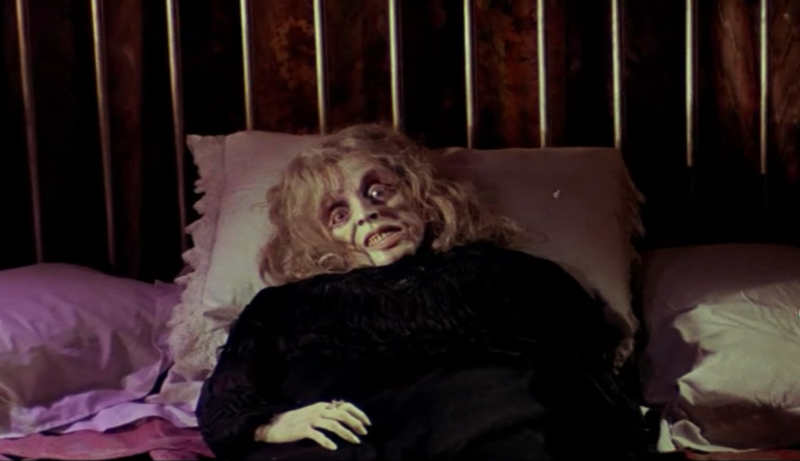 Corman had outlined a very thin sketch of a script and approached some of the cast from The Raven to see if they would be interested in taking advantage of the downtime. Vincent Price had to turn down the offer due to a lecture commitment but Boris Karloff agreed as did young actor Jack Nicholson. Karloff signed on for only a small fee with a promise of an additional $15,000 should the movie be successful, which it ultimately was not. Nicholson was eager to find work being the young and starving actor that he was at the time. Writer Leo Gordon had a rough script ready for Karloff to read, which Karloff then reportedly worked on to improve it as much as he could. With only days before the sets were to be demolished, the mad dash was on to film as much as they could. So what is The Terror really about? Good question as the script is all over the place and confusing to say the least. The film is set in 1806, although there are more than a few inaccuracies in that timeline related to history and weaponry mentioned. 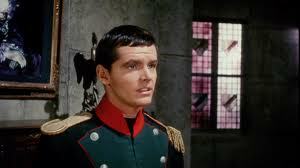 Jack Nicholson stars as Andre Duvalier, a French soldier who is lost and trying to return to his men. On a beach, he encounters Helene (Sandra Knight), a mysterious woman whom we later learn resembles Ilsa, the late wife of the reclusive Baron von Leppe (Boris Karloff). As it turns out, the ghost of Ilsa is under the control of a witch who has been tormenting the Baron for years. Along the way, we have far too many plot twists to mention. Suffice to say, just about everyone is not who they appear to be and we end up with a climatic flooding of the castle. While Corman is listed as the director of The Terror, it sat on the shelf for months, unfinished due to Corman’s schedule and a general lack of funding to wrap the film up. Several young directors ended up working on the film to finish it, including Francis Ford Coppola and even Jack Nicholson himself. However, all the hard work could not save The Terror from the very poor and confusing script. It was not a success at all and is generally referred to as one of Karloff’s lesser efforts. 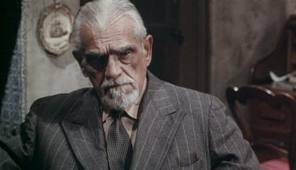 However, Karloff did eventually get paid his $15,000 after he agreed to work on Targets (1968), which many refer to as one of his best films. Targets actually features scenes of The Terror incorporated into the final act at the drive-in. For many years, The Terror was only available in standard ratio in poor prints via the public domain. However, in 2011, the film was finally restored from the original 35mm film and presented in HD and 16×9 widescreen on Blu-ray. While it doesn’t help it make any more sense, the film is now indeed quite stunning to look at. The only downside is that it does not include the original trailer. On that note alone, I recommend you add it to your collection for some late night viewing. Just make sure you are watching the restored version and not the public domain copy, which is still widely available. Gunther Dedmund Endorses Monster Movie Kid! Hey fellow monster movie kids, it doesn’t get much cooler than this. Gunther Dedmund, horror host extraordinaire over at The Basement Sublet of Horror, has officially endorsed Monster Movie Kid! Check out this great video promo! Once we put Karloff to rest for awhile after Halloween, I’ll post an update on the Free State Comicon event. For now, cool things are happening here at MMK Central and 2015 is shaping up to be an amazing year. 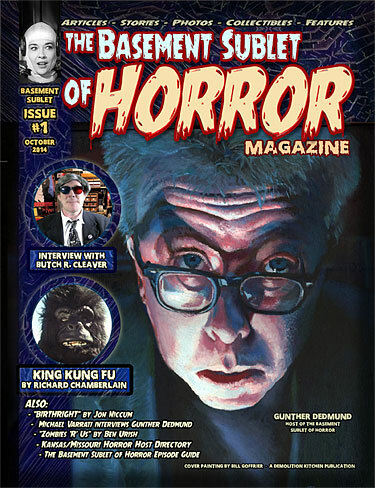 More issues of The Basement Sublet of Horror magazine, future podcast appearances and more movies to review! Thanks everyone for your ongoing support! Following The Raven (1963), Boris Karloff and Peter Lorre engaged on a rather comical tour to promote the film. A series of events and bad weather left Karloff exhausted and he returned to England for much of the rest of the year. However, he was coaxed back to the set for a smaller role in another American International Pictures release, The Comedy of Terrors (1963). Karloff was reunited with co-stars Vincent Price and Peter Lorre again as well as Basil Rathbone, whom he had worked with back in 1939s Tower of London. 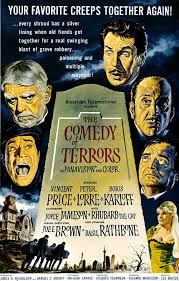 Rathbone had just recently returned to the horror/mystery/suspense genre in the more serious effort Tales of Terror (1962). Here, Rathbone clearly approached his character seriously with tongue planted firmly in cheek with the end result being classic. 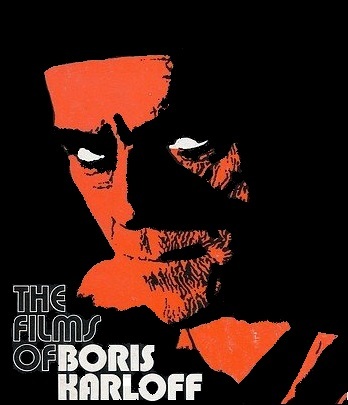 However, had Boris Karloff’s health been better, the film clearly would have had a different look. Originally, Karloff was cast to play the part of landlord John F. Black, Esquire. The role required an excessive amount of moving and jaunting around which Karloff could no longer do. His emphysema, arthritis and bad back were making simple movements painful at this stage of his career and Karloff was wise enough to know what he could and could not do. So, he accepted the role of the elderly Amos Hinchley instead, which worked out well for everyone. Vincent Price stars as Waldo Trumbull, the owner of a funeral parlor who married the lovely Amaryllis (Joyce Jameson) in order to secure the funeral business owned by her father Amos Hinchley. Amos is deaf and quite senile, usually seen slurping his soup and constantly complaining that Amaryllis never lets him have his “medicine”, which is actually poison Waldo is trying to give him to finally kill him off. Waldo prefers to drink rather than show his wife any attention, which is quite the opposite intention of his criminal assistant Felix Gillie (Peter Lorre), who clearly loves and adores Amaryllis but is too scared to do anything about it. Now, Waldo and Felix can best be described as a Laurel and Hardy version of Burke and Hare, seeking out bodies so they can perform the funeral service, reusing the same coffin time and again. But the rent is due and Mr. Black is threatening to take action unless it is paid. This forces the duo down a very hilarious path that only Stan and Ollie could have pulled offer better. Unlike The Raven, The Comedy of Terrors is played strictly for laughs. Writer Richard Matheson wisely went that route and it paid off for the most part. There are some moments where the comedy seems forced and others where it becomes a little tedious. Director Jacques Tourneur (The Cat People, I Walked with a Zombie) directed his next-to-last theatrical film and while he didn’t reach the level of his days with Val Lewton, it added to the overall star power of the movie. Rathbone is wonderful as the landlord who never dies while continuing to shout out lines from Shakespeare. Price and Lorre do what they do best, clearly working together with no effort at all and what they accomplish is gold. Comedian Joe E. Brown provides some funny scenes in the cemetery. And, of course, we have a few buxom beauties to entertain the fathers in the audience while the kids want more dead bodies. Karloff has a smaller role in the movie but he shows off his comedic talents better than in any other film. Every time Amos appears you know you are going to get a laugh. While a third film was talked about, it never transpired. Sadly, Peter Lorre would pass away the following year in 1964 from a stroke at the age of 59, making only two more films after The Comedy of Terrors. Basil Rathbone would die less than four years later at the age of 75 in 1967 from a heart attack and Karloff would die in 1969. 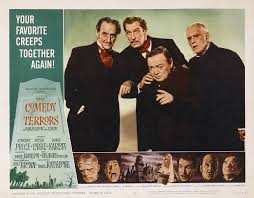 While I prefer The Raven, The Comedy of Terrors is a wonderful companion piece and well worth adding to the collection. The two films are usually paired together, as they are on the new Vincent Price Collection II on Blu-ray. Check out the trailer and prepare to be entertained. As the 1960s arrived, Karloff was finding himself as busy as ever. He hosted 67 episodes of the anthology series Thriller, not to mention starring in numerous episodes, as well as appearing in other programs and specials, such as Arsenic and Old Lace in 1962. Later than same year, Boris Karloff teamed up with Peter Lorre and Lon Chaney Jr. for a memorable appearance on the Route 66 television series in the episode “Lizard’s Leg and Owlet’s Wing”. Karloff agreed to wear the monster makeup one more time, the first in more than 20 years. To Karloff, it was a pale shade of what once was but it did prove that Karloff was more popular than ever. The Shock Theater package was now playing on televisions nationwide, giving a whole new generation of fans opportunity to discover his classic films. There was a renaissance of interest in all things Karloff so it was no surprise to find Hollywood knocking on his door once more. Karloff turned down an opportunity to star in William Castle’s version of The Old Dark House because it just wasn’t the right film for him. But, when American International Pictures offered him a role in The Raven (1963), he eagerly accepted the role. Director and producer Roger Corman (House of Usher, Pit and The Pendulum) teamed up with writer Richard Matheson (Tales of Terror, the novel I am Legend) for a more lighthearted loose adaptation of Edgar Allan Poe’s classic poem. Vincent Price was in his prime and would be reunited with Karloff for the first time since 1939s Tower of London. 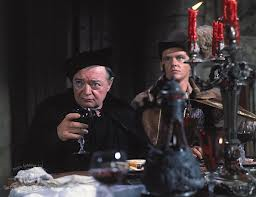 Peter Lorre rounded out the trio of terror with a great supporting cast of Hazel Court (The Masque of the Red Death) and a very young Jack Nicholson (The Little Shop of Horrors). Karloff stars as the aging Dr. Scarabus, who allegedly turns Dr. Adolphus Bedlo (Peter Lorre) into a raven after being challenged to a duel of magic. Bedlo comes tapping at the chamber door of Dr. Erasmus Craven (Vincent Price), who is still mourning the loss of his wife Lenore (Hazel Court) some two years earlier. 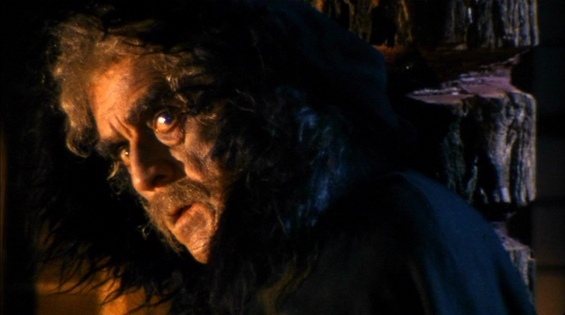 After turning Bedlo back into a human following a hilarious pursuit of ingredients for a magic potion, Bedlo informs Erasmus that his wife is alive and well at the castle of Scarabus. With their children Estelle Craven (Olive Sturgess) and Rexford Bedlo (Jack Nicholson), they all head off to the castle for a confrontation with Scarabus. He greats them with open arms and smiles that only Karloff could pull off, leaving one with a chill. Not everything is as it seems as a final battle of magic looms in their future. The Raven was Karloff’s first starring role in nearly five years and the years were not being entirely kind to Karloff. His back was continuing to plague him and walking long distances was becoming more and more difficult. His opening scene walking down the staircase is clearly edited for time. Lorre would improvise lines and while Price went along with chaos, Karloff struggled with the unexpected. His poor health was beginning to hinder long shooting schedules. Nonetheless, any on set difficulties never showed on screen and The Raven was a huge box office hit. Needless to say, I highly recommend it as one of my personal favorite Karloff and Price films. The Raven is played purely for laughs and it is indeed an incredibly fun film. The final battle between Karloff and Price is, well, priceless and Lorre’s comedic lines always bring a smile to my face. Check out the trailer on your way to track down this film. It’s available either as a triple feature alongside The Pit and the Pendulum (1961) and Tales of Terror (1962) or as a double feature with The Comedy of Terrors (1963). Better yet, you can get it on Blu-ray in The Vincent Price Collection II. Speaking of The Comedy of Terrors, more Karloff and Price and Lorre goodness is in store for our next installment of the 3rd Annual 31 Days of Halloween!